Dog must be cleaned/ well-groomed and working in an approved GSSD vest while in public. The vest must include required documentation and a full clean-up kit. Handler/Dog Team must comply with Our Dog Health Standards and dogs must pass an Annual Health Exam with their vet to verify the dog is healthy to perform required tasks. 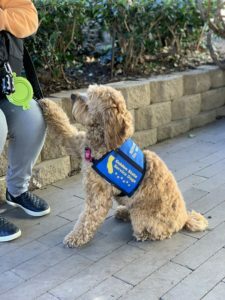 For Mobility Support Service Dogs, the dog must be size/stability appropriate; x-rays required at 24 months of age to check for genetic disease like OA and CHD, shoulder, elbows, hips/OCD; handler should talk to their vet about PennHIP and OFA with sedation to make a personal choice on what will be the best option. Handler is responsible for all costs. Handler must document 120+ hours of public access training and an additional 30+ general obedience hours, documented over 6+ months (potty training and socialization play may not be counted towards the required hours). In order for GO and PA hours to be counted, dogs should be vested and working for a minimum of 1 hour (small mini-sessions are a valuable training tool, but in order for hours to count towards requirements we want to be sure the dog can actually work for a minimum of one hour). Upon meeting minimum qualifications, the handler should document maintenance training with their dog for their next Annual Review (organized/ documented monthly). 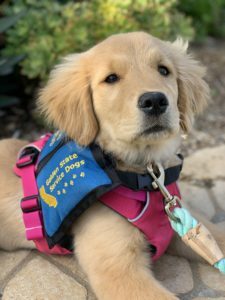 Our Golden State Service Dogs Vests: Clients are fully responsible and liable for their dogs, as agreed in the Responsibility Contract signed. Golden State Service Dogs reserves the right to refuse or terminate services to any consumer at any time. If any client misuses a GSSD’s vest or if any dog is unable to perform their duties to our satisfactory or retires, we require clients to return the vest without any cost reimbursement. Laws that support service dog handler’s rights: Please see our definitions page here. NOTE: Federal Law states that purchasing service animal ID items for any animal that has not been trained by a professional service animal trainer or passing your pet off as a service animal is criminal. Since we are committed to upholding service dog standards and etiquette, we screen all consumers and dogs in order to insure all our clients meet minimum qualifications for owner-trained service dogs.